The patient is a 22 year old, otherwise healthy man with Maffucci�s syndrome, who presented with pain and swelling of his hands and feet with prominent vascular soft tissue swellings. 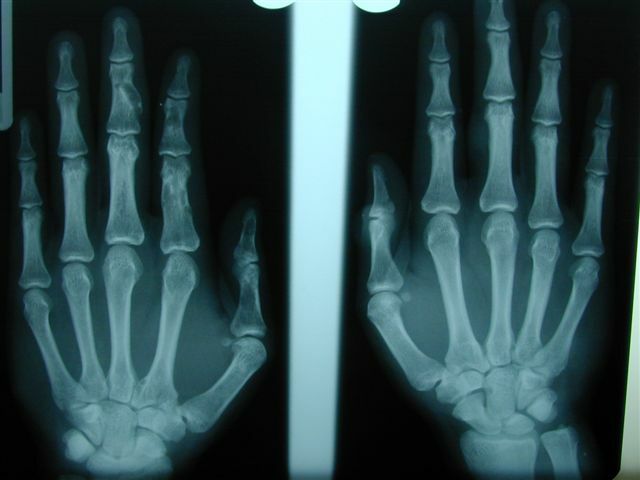 �Radiographs of the hands showed multiple expansile lytic lesions (enchondromas) with focal soft tissue calcifications (figure 1). The specimen consisted of multiple excisional biopsies of skin measuring from 0.3 to 2.0 cm in diameter.� Grossly, they were dark red-brown soft tissue nodules with a white, hard, marble-like cut surface. Spindle cell hemangiomas, originally described in 1986 as spindle cell hemangioendotheliomas (Am J Surg Pathol 1986;10:521), are uncommon lesions that commonly occur in children or young adults, although they can occur at all ages.� They initially form solitary nodules and later multiple nodules within the distal extremities, often the subcutis of the hand.� They produce few symptoms, causing delay in treatment. 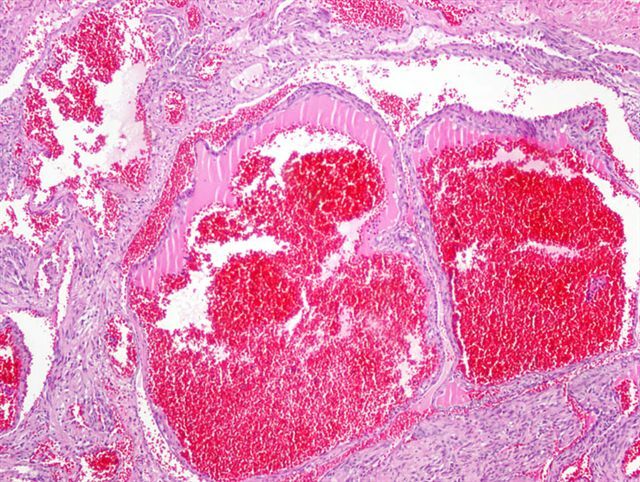 Grossly, spindle cell hemangiomas are usually firm nodules.� Microscopically, they are often partly or completely intravascular, and resemble both a cavernous hemangioma and Kaposi�s sarcoma.� They are composed of thin-walled cavernous blood vessels lined by flattened endothelial cells containing red blood cells and thrombi.� The thrombi may develop into calcified phleboliths.� The area between vessels contains bland, spindled, kaposiform-like areas, composed of collapsed vessels, pericytes and fibroblastic cells.� The spindled areas may contain distinctive round or epithelioid cells containing vacuoles and intracytoplasmic lumens, suggestive of epithelioid hemangioendothelioma.� There is no/minimal atypia and low/no mitotic activity.� The spindle cells are immunoreactive for vimentin and actin, but are negative for CD34. Spindle cell hemangiomas are benign lesions with no metastatic potential, although 60% recur.� They are believed to be vascular malformations in which variation of blood flow causes alternating areas of vascular expansion and collapse (Am J Surg Pathol 1996;20:1196).� Recurrences may represent contiguous spread along or multifocal involvement of a vessel. 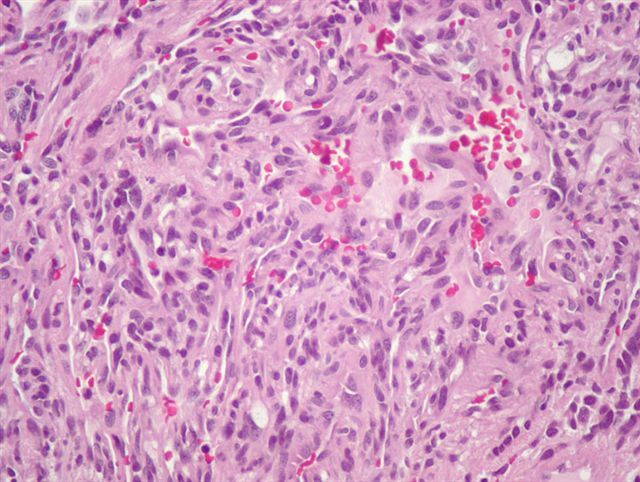 The differential diagnosis includes cavernous hemangioma and Kaposi�s sarcoma.� Cavernous hemangiomas lack the spindle cell component of spindle cell hemangioma.� Kaposi�s sarcoma has honeycomb-like vascular spaces with interweaving, elongated spindle cells that are strongly CD34+, and rarely contains dilated cavernous vessels or epithelioid endothelial cells (Archives 2005;129:1187).� The differential diagnosis may also include epithelioid hemangioendothelioma, due to the intracytoplasmic lumina.